Raj Enterprises is one of the leading Balcony Nets Dealers in Vijayawada. We are the Balcony Nets Dealers in Vijayawada providing the Balcony Netting solutions in vijayawada and surrounding areas. 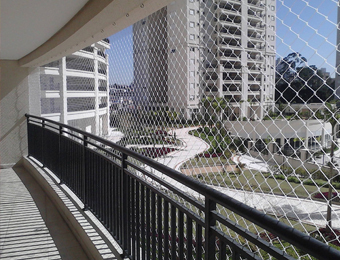 The Balcony Nets provides Security, Safety and convenience for the house holds. The high raise appartments are prone to distrubance from birds like pegions and other birds. usually the Pegions will find these high raise appartments as the convenient place for nesting. This creates a lot of distrubance for the residents. The Balcony Nets provides a great solution for this problem. Raj Enterprises is leading Balcony Nets Dealers in Vijayawada is dealing in different varieties of balcony nets. These balcony nets are available in different colours. You can choose from the range of colours to suit your building colours. We also provide installation services for the balcony nets.